1. Toss the pork strips in the cornflour to coat evenly. Add in 1 tbsp of cold water and rub with your hands until the meat is covered in the paste. 2. Warm a wok over a high heat until very hot. Add the oil and pork then stir fry for 4-5 minutes, until cooked through and evenly coloured. Remove the pork with a slotted spoon and set aside. Add the cucumber, onion and pepper and cook for 2 minutes. Then add the garlic, ginger and beansprouts and cook for another minute. 3. Remove the wok from the heat and return the pork to the pan with 2 tbsp of cold water, the soy sauce and sweet chilli sauce. Scatter over the coriander, then serve. 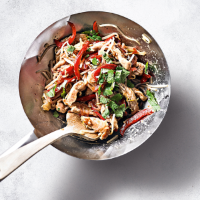 Cook’s tipAlso delicious using essential Waitrose British Beef Steak Stir Fry.